Our Epiphany celebrations in the parish have become rather special – celebrating the Eucharist followed by entertainment and a sumptuous meal. This year we were entertained by John and Helen Wright and Sue Dyson and truly wonderful it was too. The meal that followed gave a variety of choices of both main course and dessert – a triumph of culinary art. After three years this has now become established – hopefully a tradition. When I was asked to write this page, I started thinking a bit more about the significance of something like this. It takes a lot of hard work to make an evening like that pass with apparent ease, creating a relaxed atmosphere. It takes planning organising and many hands doing what is required. There is shopping to get, furniture and crockery to collect and arrange, cooking to be done, entertainment to rehearse. It takes using many of the gifts that God has given us. Paul’s first letter to the Corinthians chapter 12 lists them for us – prophecy, ministry, teaching, exhortation, giving, leading and compassion. We often hear about the ministry of all members and this is a perfect example of it in action. We have all been given gifts, some more obvious than others, and yet strangely it is the less obvious that, day by day, make the real difference to our lives. We admire an actor making an Oscar-winning performance and an athlete winning a Gold medal, but they are just the icing on the cake. We can, and most of the time do, live without them. The things that really matter are the little acts of kindness and thoughtfulness. These are the things that keep the wheels rolling day after day. Take a look at the churches and their surroundings, and then think about the amount of work that is required to keep them so beautiful. Think of the obvious things like the flower arrangements. Then think about less obvious things like keeping the church clean, ironing the linen, and in summer there is grass to mow in the churchyards. Then listen to the sounds: think of the music and the bell-ringing and, less obviously, the clock-winders. We have wonderful bands of people who visit the sick at home and in hospital, and others who give up their valuable time to attend committee meetings where decisions are made on our behalf. There is general maintenance and administration. And so much more, the list is endless. God has given us all so many gifts. The best way to praise him and give him thanks is to use them for each other – a true ministry of all members. Malcolm McKelvey died on 29th December, having enjoyed more than seventy years of music making including being a boy chorister, organist, piano accompanist, recitalist, opera repetiteur, choir trainer, conductor, lecturer, examiner and adjudicator. He also played the violin, bassoon and ukulele. Born in Birkenhead in 1926, from early days Malcolm had an aptitude for music. He was encouraged by his parents and teachers, and took up his first organist appointment at the age of fifteen. Called up into the army, Malcolm was posted to Malta where he became garrison organist. An interview at St Peter’s Hall (now College), Oxford, led to his appointment as Organ Scholar in 1947. From then on there was never a lull in his musical activities. 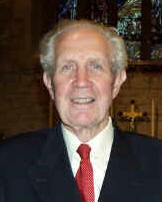 Malcolm was Director of Music at three schools – Wrekin College, Brighton College, and finally Christ’s Hospital, Horsham, from which he retired in 1985 after 23 years. Many of his pupils went on to distinguished musical careers in their own right and countless others have given thanks for the profound enjoyment of music that he helped them to discover. Invited by Fr Ian Hazlewood, Malcolm came to Prestbury in 1989 as organist at St Mary’s, a post which gave him enormous satisfaction and fulfilment. He trained and encouraged many choristers, and arranged enjoyable concerts to give young people the opportunity to play to parents and friends. He instigated an annual series of mid-morning concerts preceded by coffee, and founded the Prestbury Camerata and a wedding choir drawn from St Mary’s and St Nicolas’. Malcolm was an instinctive accompanist of worship, a rare ability that springs from his faith. Visiting singers and instrumentalists invariably commented on his gifted accompaniment. We have all delighted in Malcolm’s compositions – organ works, settings for the Eucharist, settings for psalms and hymn tunes. I once mentioned to him that I found the traditional Ratisbon rather dreary for Wesley’s majestic ‘Christ whose glory fills the skies’. Within a week he arrived at the Vicarage with a new tune that he had written – appropriately named Viveash – and now we would sing no other. Latterly he was also a prolific composer of manageable pieces for aspiring organists. Malcolm was meticulous in all that he did. His record keeping was legendary. In answer to the question of when we had previously sung a particular hymn, he would consult his record book, and be able to tell the exact date. This precise mind and meticulous eye for every detail gave me an inkling of why Malcolm had a particular love for the intricacies and complexities of Bach fugues and yet seemed to play them so easily. Eagerly anticipated choir outings took place each summer, usually to cathedral cities. In every place, Malcolm had contacts and friends, and their welcome of the Prestbury visitors always enhanced the trip. Invariably he knew the organist and we were invited to visit the organ loft and other parts that visitors rarely penetrated. Malcolm has been strongly supported by Christine, and together they have contributed greatly to the life of the parish of Prestbury and to music making in Cheltenham as a whole. They have been a complementary team. Sadly, illness meant that Malcolm had to take a less active part in the musical life of the parish, which was a tremendous loss to us. Asking him to relinquish his post was one of the most painful tasks that I have had to do. Although music was the dominant force in his life, Malcolm was also a gifted calligrapher and drew well. In earlier days he was an accomplished small arms marksman. He loved travel, particularly France, and enjoyed family camping holidays. He retained a lifelong interest in Tranmere Rovers, and enjoyed a relaxing pint after choir practice with some of the more senior members. My very last words must be of Malcolm’s faith. Of his great belief in the loving God who created him, of the Holy Spirit who inspired him, and of his trust in the Saviour who died and rose for him, and who came to take him to himself. Malcolm has inspired so very many people. He was invariably kind, supportive and encouraging to all who came into contact with him. No words can adequately express our gratitude for him. Thanks be for the very special ministry of this good, humble, modest servant of God. May he rest in peace. Christine and James would like to say a special thank you to everyone who helped to make Malcolm’s Thanksgiving Service so moving. It was a wonderful tribute to a great musician. Thank you for sharing it with us. I enjoyed having a chat with Andy Macauly, our Parish Youth Worker, and can only say that I am impressed with the amount of work that is being done. I already knew of the four main groups of organised youth activities and visited the open day they had at St Nicolas’ last year. However, talking to Andy helped to fill me in with the work of the groups. Elevate and Synergy have the accent on faith so that our young people can explore in their own way more about what we older ones have found in church going. Elevate is for school years Y7 and Y8 and they meet on Sundays from 5pm to 7pm, then Synergy carries on with the Y9+ students from 7pm to 9pm. The Space and The Lounge are more youth club style, with The Space catering for Y7 to Y9 on Thursdays from 7.30pm to 9pm and The Lounge for Y10+ on Tuesdays from 7.30pm to 9pm. All of these meet in St Nicolas’ Hall during term-time. On Tuesday after school at Pittville School there is Pittville Circus Skills, and on Wednesdays a day working with students at risk of exclusion. At St Mary’s Junior School there is a group for Y6 during their RE sessions, with the idea of preparing them for their secondary education. Quite a busy week for the young man who came to the parish nearly six years ago. Of course there have always been active youth organisations in the village with the Brownies and Guides, Cubs and Scouts, as well as organised sports activities. But Andy is our first designated full-time Parish Youth Worker to organise groups for the 11- to 18-year-olds. His wife Sharon works with the volunteer team, particularly with Synergy, and also copes with a busy husband and their young son. In their team there are 15 adults and 10 young leaders who help to share the load. Their aims are to provide meetings where young people become aware of the different choices there are and help them to become more settled with their lives, knowing the boundaries of acceptable behaviour. They have a regular programme of varied activities and recently supported the ‘Inspire’ youth event in Gloucester Cathedral. It can also include ice skating visits, all night watches, trips to the Forest of Dean, and the annual camp at the Greenbelt Festival on the Racecourse, when three of the student leaders are members who have gone on to higher education. Fr Michael is Andy’s line manager, who is always ready to give of his experience, and Tricia Wilson, our excellent fund-raiser, has made all the difference with the financial side of the project. This financial aspect is becoming increasingly challenging. They do need regular support from us, and Andy would appreciate more funding to enable them to maintain and develop what they can offer. Volunteers are always welcome – please contact Andy. We are lucky to have this talented, dedicated young couple living and working in our midst who feel that the work they do is what matters most to them. Let us hope they are able to stay with us and that one day, their young son will be able to join in these welcome groups. … when we seek happiness? … when we face suffering? … when we make decisions? … when we contemplate death? … when we try to make sense of life? Following a very successful Lent Course in 2005 we are anxious to start making arrangements for this year’s course with sufficient time, in order to avoid a repeat of last year’s frenetic last-minute planning. Were you involved last year and are you able to be part of this year’s course? Would you be able to host a group meeting in your home? Do you feel able to lead a group? Resources are provided for you. Will you come and be part of a group, to share in the discussion, reflection and hospitality? The Team-wide Education Group has already identified people who are willing to co-ordinate the organisation of Lent Groups in each parish – but Lent Courses know no boundaries. You may attend whichever group is most convenient for you. Posters will be displayed in each church giving information about the Lent Course (in glorious Technicolor!). There are lists for you to sign up and you will of course be hearing more about it in the weekly notice-slot at our main Sunday Services. Celebrate! went ‘over the rainbow’ recently when the theme of The Wizard of Oz was used to explore our spiritual journey. Each week different members of the Celebrate! team did a great job leading the service dressed as the main characters of the film. Sue became the Scarecrow; Andy was the Tin Man; Father Michael played the Lion and Kathryn became Dorothy. Much to the delight of the children we had a real live puppy in church too as Dorothy’s dog was played by Kathryn’s puppy. We also watched clips of the 1939 film of The Wizard of Oz where Dorothy meets each of the characters and we learn that the Scarecrow would really like a brain, that the Tin Man would love to have a heart and that the Lion was desperate for some courage. It was unusual and great fun to be watching a film in church! Each week we followed the characters on The Yellow Brick Road as they each took a journey of discovery, challenge and friendship, which resulted in each of them realising that they all already possessed what they were looking for. And, of course, Dorothy also discovers that ‘there’s no place like home’. At the end of each service, we all wrote prayers or did drawings on small yellow pieces of paper which we then took to the front of the church and glued to a long piece of paper which became Celebrate!’s own Yellow Brick Road. Sharing a great start to the New Year! It was a surprisingly bright, mild morning which greeted us early on New Year’s Day and an even more cheerful welcome awaited everyone at St Mary’s; instead of our usual Celebrate! service at 9.30am, we had decided to have a very sociable ‘Bring and Share’ breakfast. So, once everyone had deposited their very generous breakfast donations on the breakfast table at the front of the church, we started the morning with some festive music in the form of a number of traditional family favourites Christmas carols, expertly accompanied by Frances on the piano. This was followed by Father Michael’s welcome and introductory New Year prayers. Then it was time to tuck in to an amazing feast of croissants, bagels, bacon and mini sausages, yogurts, muffins and various other delicious goodies. The children all enjoyed their treats and there was a definite peace as they enjoyed their breakfasts with their friends, while the grown ups chatted and exchanged Christmas and New Year stories. Suitably refuelled, we ended the service with a couple more carols before having one last opportunity to view the lovely crib scene and nativity figures at the front of the church. All in all, an excellent start to 2006 (although not good for the diets…) – thanks to everyone who made this possible and a Happy New Year to everyone! In early February we are continuing our series on some of Jesus’ parables. We aim to present these each week so that whatever age you are, or whatever stage along your Christian experience, you can connect with something relevant for you. Each week our music group leads the singing parts of our worship and sometimes other parts too. We enjoy old favourites and a steady trickle of new songs. The more energetic enjoy the range of percussion instruments on offer and some of the more reflective songs lend themselves to more gentle flag waving. We have a web site www.prestbury.net/celebrate where you can find pictures and news. Most weeks there is also ‘Going Deeper’. If you are at Celebrate! you will know that this is on a paper slip but if you can’t be there then logging on is a handy way to make sure you don’t miss out on the action. ‘Going Deeper’ is always tied in with the theme of the worship that week and offers guided thoughts for reflection during the week. In the first three weeks of February we will be looking at ‘The Persistent Widow’ from Luke chapter 18 verses 1-8, ‘The Workers in the Vineyard’ from Matthew chapter 20 verses 1-16 and then we’ll have a go at making up a Modern Parable. The end of February will see the start of a series about unwrapping some of the ‘I am …’ sayings of Jesus. If any of this is making you curious – that’s great. Come along to St Mary’s any Sunday at 9.30am and experience Celebrate! for yourself. Well, we may not be sending chill tremors of spine-tingling terror through the Chelsea dressing-room and Arsène Wenger is scarcely quaking in his boots but Prestbury Parish now has its very own footie team. Eighteen hardy souls rose to the challenge that had been set before us by the good folk of St Matthew’s (who play regularly in a local league for church sides) and took to the field on a crisp but bright December morning. Sadly the final scoreline of 8-2 to St Matt’s wasn’t all we might have hoped for but there were one or two moments of brilliance and a really solid first 20 minutes with an even more impressive come-back in the last quarter of an hour. Above all, the spirit of the game was great, everyone enjoyed themselves and buoyed up by drinks and the odd chip in the Royal Oak afterwards, the team were keen for more. So onto 14 January, which saw us trekking over to Naunton Park to play New Life, a free church from Leckhampton, with more than one player sporting suspiciously shiny boots still fresh from their Christmas wrapping paper. On a heavy, mud-strewn pitch though, the gleam of the new boots didn’t last for long, and again, stamina and fitness told against us. Just 1-0 down after 40 minutes, we were feeling this was a game with chances for us but we conceded again on the stroke of half-time and the second half saw us defending frenetically. The star of the show without a doubt was Nick Moore who pulled off some stunning saves (despite barely being able to stand up for all the mud!) and one particular effort, diving full-length to palm a great strike away from the top right corner, was worthy of a TV replay. Our best chance came from a sustained period of pressure leading to a handball but the penalty was struck just over the bar. Meanwhile goals leaked in at our end and at the final whistle we found ourselves on the end of a 5-0 defeat. Nonetheless, well done to everyone who has played so far and made it such fun to be part of. Better things should come as we start to find our feet as a team and play together a bit more. We’re arranging matches against some of the other Cheltenham church teams through the spring and, who knows, we may even be ready to join the Church league next season. If you’d be interested in playing, supporting or even offering a bit of coaching from the touchline, please ring Fr Grant or Andy Macauly. Next match 11 February – Come on you Prestbury! Sarah is on her way from the lowest point on Earth to the highest, the first part of the journey being by bicycle. The team at this stage comprises cyclists Dom, Jamie, Nic, Pauline and Sarah, with Dickie and Rowena driving the support vehicle. They cycled 107km on Christmas Eve, spending the night in a hotel in Damascus, then 64km on Christmas Day (after Sarah had opened her stocking! ), sleeping that night in a derelict building somewhere in the Syrian desert, and then managed another 105km on Boxing Day. On New Year's Eve they cycled 167km, sang Auld Lang Syne at midnight and were fast asleep by 12.10. On 1 January 2006 they crossed into Turkey and are now somewhere in Iran. For up-to-date information see the online diary on www.everestmax.com. Some two years ago, one Sunday afternoon, a Parish discussion was held in St Mary’s church to discover what the parishioners of Prestbury felt the Church should be doing to serve the needs of the Parish. One of the most strongly felt views was that the Church should take a more active part in village life, to present a more welcoming image to those living around us. I think most people would agree that this last year, in particular, has seen a good start on this campaign. We have held a fete and barn dance free to all comers in the Royal Oak pub garden which was sheer magic. There was a Gardens open weekend with cream teas at the church. Some of the tea-drinkers suggested ploughman’s lunches next time! The English Heritage open weekend brought more strangers than congregation members into St Mary’s. For our own benefit we have had a quiz night, a pudding party with ‘Snow-White and Co’ bringing the house down. The Celebrate! congregation has developed a character of its own with a 1st Birthday party and a very successful New Year’s Day breakfast party. Two Sunday pub lunches were a complete sell-out, as was this year’s Epiphany supper. The launch of this year’s stewardship campaign turned into a relaxing cheese and wine evening with the revelation of more priceless drama. Finally a certain rather manic beetle drive at St Nicolas’ should not be forgotten. Such a wide range of events needs help and information from all quarters. The Parish Events Committee (PEC) is very small. We don’t mind working hard – it’s actually good fun (most of the time!) – but we are concerned because unless we have contact with all ages and groups we won’t know what you want. We have all enjoyed ourselves this year, but to continue at this pace we need more general help and more Committee Members to provide the ideas as well as food, drink, entertainment and furniture and crockery shifting. Could people who have volunteered as catering helpers in the past, or people who would like to join in that, please contact Shirley Brown (St Mary’s) or Gill Wood (St Nicolas’)? General helpers or anybody wanting to join our committee please get in touch with me (Lynda Hodges). Help us think up new ideas, we don’t meet very often and our evenings are far from boring – come and try us out! As requested we donned a posh frock and smart tie and jacket ready to attend the New Year’s Eve party at All Saints’ church. There was a warm welcome for us when we arrived and a glass of wine. There had obviously been a great deal of hard work done to provide such a delicious buffet and attractive tables. At the mid-night hour we sang ‘Auld Lang Syne’ and wished each other a Happy New Year over a glass of sparkling wine. This occasion gave us an opportunity to meet with our friends from All Saints’ and of course to wear our posh frock and smart tie and jacket. What a wonderful evening we had at St Mary’s church to celebrate Epiphany! First of all there was a United Sung Eucharist to which Father Michael welcomed everyone, especially the clergy and members from St Peter’s church. After the lovely service, mulled wine and mince pies were served. We were then entertained by John and Helen Wright and Sue Dyson with a delightful medley of seasonal music. A delicious hot supper of ham, chicken or quiche was then served, followed by gorgeous desserts; all this was accompanied by a constant supply of wine!! Thank you very much to everyone who helped in any way to make it another wonderful Epiphany celebration. Now that Christmass is past for another year, and things are starting to return to normal I have managed to write something about my experiences of the first term at St Stephen’s House, here in Oxford. The start of last term was almost four months ago, but I remember very clearly how nervous I felt on that first afternoon, meeting the other twelve new students who would be my colleagues on the course. We drank tea together, and then joined the rest of the students and staff in Church for the Sung Mass which would herald in the start of the new term. In fact, I have subsequently discovered how important worship and prayer is in the life of St Stephen’s House. Not only is the beginning and end of each term marked by a solemn act of worship, but morning and evening prayer, and a celebration of Mass are actually offered every day. So praying and worshipping together play a very important part of my training for ordination. Of course, I am also at college to study, and I have lectures most days during the week. Subjects studied last term include Old and New Testament, Church History, Doctrine, Greek, Mission and Ministry, and some Liturgy. Each subject requires essays and assignments to be written, so it was a shock to discover that I had thirty essays to write before April 2007. So in addition to prayer, worship, and lectures, private study occupies time each day. I also spend one afternoon a week on placement at a local C of E primary school, trying to teach Year 6 children primary science. I don’t know whether it is the children or I that are more confused! But life here is not all work, and no play. Living corporately with a total of twenty-six ordinands means we do much together socially, and have a lot of fun. Living in community also inevitably means that there are periods of tension and conflict, but part of formation to priesthood is about learning to deal with those. So overall I am enjoying my life in Oxford, although my course is hard and demanding. What is particularly scary is that I have already completed about one-fifth of my course, and am already being asked to think about where I may wish to serve as curate. And for me that is one of the real challenges of being an ordinand. As soon as I begin to settle in to life at Theological College, I am reminded that God is calling me to Priesthood, and I mustn’t become too comfortable in Oxford. Thank you to all those who kindly supported the carol singing at Cheltenham supermarkets on 17 December. Their efforts resulted in £143.14 being raised at Tesco’s by St Nicolas’ and £122.86 raised by St Mary’s at Sainsbury’s. Prestbury Parish total was therefore £266.00. Cheltenham Churches total was £2365.84, which included three school carol sing-ins at Waitrose store. Well done to everyone taking part! The Christmas donations total is not yet known, but will be announced in the March magazine. Our Parish Christingle Service held in December at St Mary’s Church raised £306 for The Children’s Society. Thank you to everyone who attended the service and helped us reach this fantastic total. Very many thanks to all the box-holders who have helped to collect a total of £344.71 during 2005. Thanks also to Enid Cowley who patiently helps me to count all those pennies. Thank you to all who supported the various stewardship events held in the autumn. Everyone should, by now, have received a stewardship envelope with a return pledge card. Please think prayerfully and carefully about your response and return it to the recorder, either by post as per the envelope, or by way of the collection bowls in church. We are grateful for your generosity. Our next bakestall this year falls on Sunday February 19 with contributions from members with surnames N-Z. Thank you to everyone who brought and bought last year, when we were able to send donations amounting to £368 to the charities we support, namely Practical Action, Mission Aviation Fellowship, Care International, Viva Network, Children in Distress, Breadline and Hope Africa, Lepra, Christian Aid, SOS Children’s Villages, Everychild, Age Concern and the Medical Foundation as well as the Disasters Emergency Committee Appeal for the earthquake victims. Our programme for 2006 has been prepared and our next meeting will be held on Tuesday February 28 at 7.30pm in St Nicolas’ church. It will take the form of our annual meeting and include a Eucharist led by Fr Michael, a renewal of promises and the re-dedication of the Prestbury Mothers’ Union banner. We are most grateful to Ruth Shaw for the wonderful work she has done on bringing our banner up to date and into a wonderful condition. Please join us on this happy occasion when any new members would be most welcome to come and see what we are like! We are looking for someone to take over the duties of Lettings Secretary from Tricia Wilson, who is retiring after long and faithful service. The main requirements are an ability to manage a schedule of regular bookings, take occasional bookings, hand out and receive keys, handle the payments and join the Committee. For further information please contact Nigel Woodcock, Alan Jackson or Tricia Wilson. The Vestry Meeting and Annual Meeting will be on Sunday 2 April at 6.30pm. The parish web site had its 50,000th visitor on Sunday 15 January 2006. If anyone is interested the full statistics and details of our visitors’ habits may be viewed by clicking the multicoloured square at the bottom of any page on this website. As part of St Mary’s Flower Arrangers I would like to thank all the arrangers for their time and expertise during 2005. Each week the flowers in church have been beautiful, and at Weddings (of which there have been many) and Festivals, all the ladies involved have surpassed themselves. It is a delight to see the flowers, and it is always a welcome to visitors who have time to attend a service or who are merely ‘passing through’. As we begin a new year, and before the new Flower Rota appears in time for Easter, may I make a plea for help? We are always looking for volunteers and this past year has seen a considerable reduction in our numbers for various reasons. We desperately need more helpers! Please, please, is there anyone who feels they might be able to spare a little time to be part of the team? We do need ‘apprentices’ and they will be given tuition. You do not have to meet ‘Cordon Bleu’ standards before volunteering! Young or old, male or female, everyone will be made very welcome. Please, please, do give this request some serious thought. Thank you. Thank you to all who contributed to this project. A grand total of £143.50 was donated, which we have rounded up to £150 and forwarded to World Vision.